– The diuretic qualities of horsetail may cause a potassium deficiency, which is bad for the heart. – Horsetail contains nicotine, so drinking a lot of horsetail tea is not a good idea if you are on a nicotine replacement therapy, as it may cause side effects related to nicotine overload. 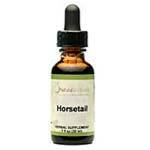 – Horsetail may interfere with ACE inhibitor drugs, causing excessive potassium absorption. Be sure you do your research and understand what you are getting into before you implement any herbal supplement plan. It may be easy to get confused amidst all the details. For example, horsetail’s cousin, the rough horsetail (or equisetum hyemale), is sometimes used for bedwetting problems, but the two plants are not the same. Your best bet is to consult with a physician before adding horsetail to your diet, and to be sure you are comfortable with the possibility of horsetail extract side effects.